Diarrhoea is a common illness for more than a third of people in Honiara, the coastal capital of Solomon Islands, where informal settlements with poor sanitation and water dominate. But the risk of diarrhoeal disease increases in the annual wet season, from November to April, and escalates during floods and natural disasters. The World Health Organisation predicts that diarrhoea and other diseases are likely to be exacerbated by climate change, contributing to an estimated 250,000 additional deaths each year between 2030 and 2050. This common, treatable illness could place an increasing burden on the health services of Pacific Island states. In April 2014, a torrential downpour of more than 732 millimetres in Honiara over four days unleashed a deluge in the city’s rivers and surrounding coastal plain where most of the urban poor reside. Thousands of people were displaced by the flooding into evacuation centres, including school halls, while water and sanitation infrastructure sustained millions of dollars’ worth of damage. This crowded community of about 630 people is situated on the Mataniko River estuary in the centre of Honiara. Here, the intense South Pacific sun doesn’t penetrate the narrow dark alleys between shanty homes. Families live in precarious dwellings built of wood, corrugated iron, and other materials, constructed on damp, sandy ground and highly exposed to cyclones, sea surges, and river flooding. By the river, teenagers play football next to rubbish piled along its banks, while women wash clothes and children play in its waters. Kevahu remembers that many people avoided the nearby crowded evacuation centres during the flood, choosing instead to stay in the settlement, despite lack of sanitation and clean water. 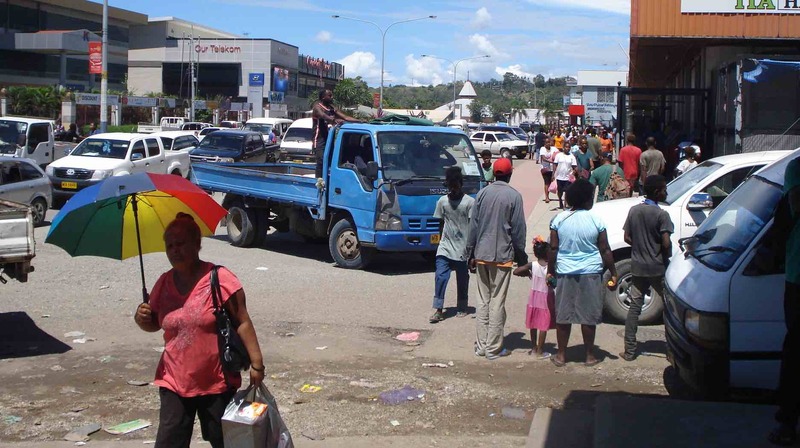 Barely two weeks later, the Ministry of Health and Medical Services detected a spike in diarrhoea in Honiara caused by the contagious rotavirus, which also spread to the evacuation centres. Later studies found that 4087 people were stricken with the illness, including more than half of all children in Lord Howe Settlement. The outbreak then spread to other provinces, with more than 6000 cases and 27 deaths recorded, mostly of children under five years old. This wasn’t an isolated event. In December 2015, a nationwide surge in diarrhoea cases meant the average incidence of the disease for that time of year leapt by more than 2000 cases, resulting in six deaths. A year later, people in the south-east Makira Province were afflicted by a diarrhoea outbreak following an 8.0-magnitude earthquake. Josephine Teakeni, president of Vois Blong Mere, a local women’s civil society organisation, has seen the problem first-hand. “For the flash floods and climate change–related water issues, it is not going to get better, it is going to get worse,” she said. Urban centres across the country are growing rapidly as rural islanders seek jobs and access to public services. However, a severe shortage of affordable housing in the capital has caused squatter settlements to mushroom, many in the city’s flood-prone areas. According to a government assessment, the extensive impact of the 2014 floods was due largely to unregulated urbanisation, especially the construction of poor housing on low-lying ground. Vulnerability is also high due to the fact that one in three of the city’s households live within 500 metres of a river or coastline. But Teakeni says that it doesn’t take a flood to put people at risk from common diseases, especially those living next to the Mataniko River. George Titiulu, at the Health and Environment Services division of Honiara City Council, said studies have shown a high level of E. coli in the Mataniko River, even in the upper reaches beyond the sewerage discharge points. The council says it is monitoring water quality in the civic water supply and local waterways, while the city’s water-pipe system was upgraded two years ago. “But in the settlement areas, people are using untreated water,” Titiulu said. This affects hygiene and the preparation of food. Diarrhoeal diseases have become the fifth leading cause of death in Solomon Islands. The Ministry of Health is planning to complete nationwide rotavirus vaccinations by 2019, and the Solomon Islands Water Authority (SIWA) is rolling out the supply of piped, metered water to city homes, including those in the informal settlements where possible. Yet paying monthly water bills will cause added financial strain for many settlement families. Improved disaster preparedness measures and resilient water and sanitation services for the city’s poor is a priority. And not only for Honiara, given that about 25% of Solomon Islands’ population is expected to be living in urban areas by 2020, and extreme rainfall is expected to increase. The challenge isn’t simply to install pipes and water filters. Vois Blong Mere believes it is equally important to improve women’s literacy and understanding of meteorological information, in particular the technical language experts use in weather forecasts, so they can better understand guidance and take timely action to protect children.